It was my first time in Capri. It was my first time in Italy. There I was. Eating a caprese salad. Sitting with Angelo Cinque. I was young and he was old. We were there together because of a chance meeting on a bus from Positano to Praiano on the Amalfi Coast. A meeting that started a friendship that I will cherish forever. He was Italian....he was classic...he was kind....he danced....he broke into song often and anywhere....he was unforgettable and he became one of my favorite memories of my first time in Italy(and second when I returned a few years later with my Mom and sister). He told me stories and shared his memories. He had a way about him and everything he did. More like a character in a movie. Someone dreamed up to be that perfect graceful gentleman...that cooking singing Italian...not real...but he was so real. He had a small house with a beautiful view up in the hills of Praiano and he proudly flew flags from all over the world. In the smallest kitchen I had ever seen, with barely even a counter to work on or half of a fridge, he made us some amazing meals. I remember wondering how anything so delicious and grand could be made in such a simple little space. I remember eating a salad dressed with olive oil, fresh squeezed Amalfi Coast lemon juice and salt as Angelo sang to me in his dining room. They were such simple things and yet the moment was so magical. So perfect. So Italian. 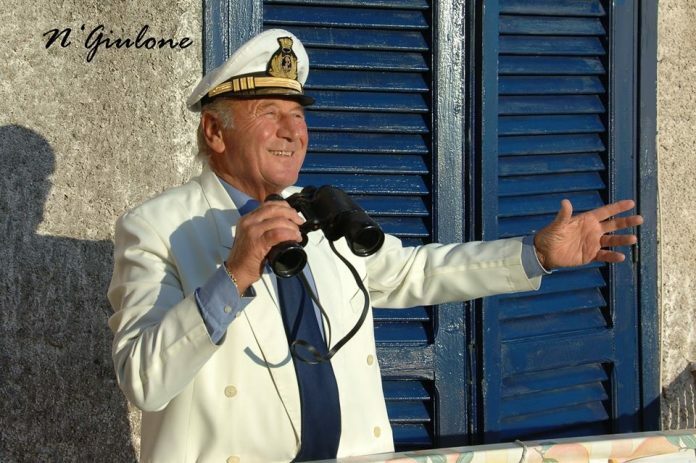 As a native to the Amalfi Coast, he knew everyone and everywhere to go. He was a proud Italian and he wanted to share his beautiful country. We spent days out exploring. We saw Amalfi, Positano, Ravello, Mount Vesuvius and other towns along the coast. On one of our days together we decided to see the Island of Capri. We traveled by boat......leaving from where I can't remember now. We arrived in Capri and we rented a Vespa. I remember the man we rented it from, seeing a young girl with a much older man, giving us an eye and quietly telling Angelo "she will only break your heart". We both smiled at him as we drove off. Knowing what it must look like but knowing what it was. We walked around Capri - talking, shopping, drinking coffee, eating gelato. He bought me a magnet that still hangs on my fridge. A little white house with blue windows and a door that simply says Capri. I treasure it. We were everywhere that day it seemed.....maybe we circled the island....I have no idea...It was all so different and beautiful and I was enjoying being lost in a world so new to me. We arrived at a little restaurant. I barely have a picture left in my head of this place but I remember being high in the hills, no town, the cliffs, the ocean, no trees, wide open. The menu was all Italian and I didn't speak much then. I remember asking Angelo about a salad. He said....."oh it's delicious! It has tomato and mozzarella.....you will love it". I ordered it. I had no idea that I had just ordered my first ever Caprese salad and on on top of that, on the Island of Capri where the dish was born. At first glance I was disappointed. It said a salad, and this being my first time in Italy, and really not having had much culture previous to this trip, I was thinking lettuce and then all the yummy things mentioned on top. I wanted green vegetables but instead I received an edible Italian flag made from ripe red tomatoes, creamy white mozzarella and vibrant green basil. A color trio seen often in Italy and something I love so much! After the first bite there wasn't one ounce of disappointment left in my body. That taste....those flavors. I didn't know it at the time, but right then and there, it was the beginning of a love for a meal that I have eaten more times than I can remember. It seems silly now that at that point in my life I had never heard those two beautiful words - insalata caprese- but I hadn't. It was something so new and so Italian. It was truly delicious....and after all these years, I still think about that moment - that day - every time I make it. I think about Angelo and I think about what an adventure there was surrounding a salad. I smile. I eat. I smile agian. Cut equal parts mozzarella and tomato into slices at least a 1/4 inch thick. Arrange the sliced mozzarella, tomato on a plate, alternating the 2 ingredients. Add basil leaves. I had small basil leaves from my garden so I put them on top, but if you have larger ones they can be layered along with the tomato and mozzarella. Drizzle with the extra virgin olive oil and sprinkle with salt and pepper. This dish is best when eaten at room temperature and it definitely goes good with wine!